Recently I ran across an eBay seller who had a bunch of great cards listed with opening bids of just 99 cents. Shipping was $3.99 though, which probably turned a lot of potential bidders away, after all who wants to pay almost four bucks to ship a card you paid a buck for? If you read the fine print in his item descriptions though, all you had to do was win 20 auctions and you'd receive free shipping. 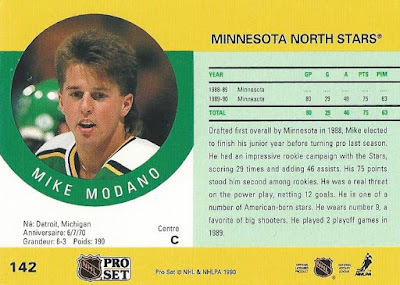 The '90-91 Pro Set release was, in my humble opinion, one of the greatest sets released during hockey's "junk wax" era. I've always loved the simplistic, colorful design, and the photographs are interesting as well (and fairly high quality for the time period we're talking here). I think more of these cards were printed up than perhaps any other hockey set in history, but that doesn't make me enjoy them any less. 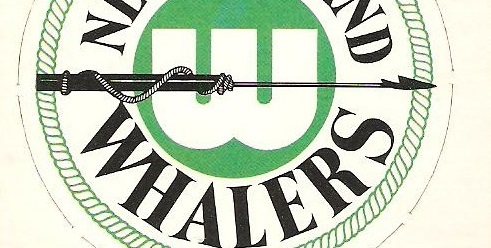 It was a simpler time in hockey card collecting back then. In the absence of parallels, serial-numbered cards, game-used relics, and autographs, it was all about collecting the base set. 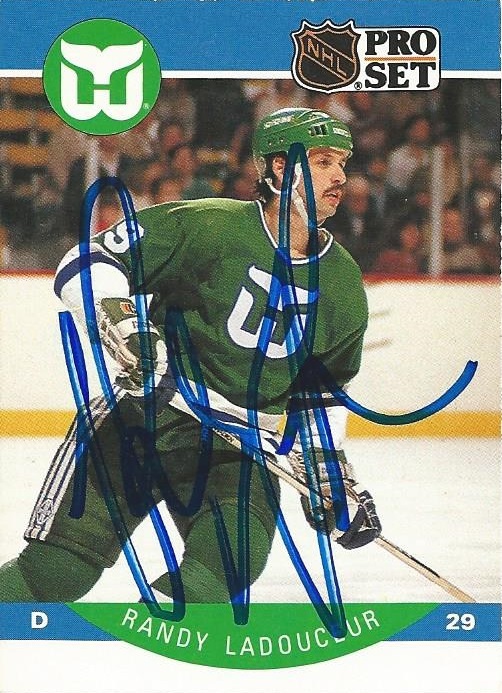 When I ran across this autographed copy of defenseman Randy Ladouceur's card while combing through the seller's inventory I placed a bid immediately. I usually stay away from in-person autographs unless I'm the one obtaining them, or they come from a trusted source, but I highly doubt there are many folks in the business of forging Randy Ladouceur autographs on over-printed '90-91 Pro Set cards to make a 99 cent profit. If that is the case, oh well, I've certainly wasted a dollar bill on far worse. Here's a look at the back, even these were well done if you ask me. You get a nice portrait photograph that's different from the front and actually gives you an idea what the player looked like, along with career stats and a nice write-up. All of this is presented on a similarly colorful layout to the card front, without feeling too cluttered at all. Yup, I love this set. Obviously based on the title of today's post I've got another autograph from this release that I picked up in this batch as well. Who is it? 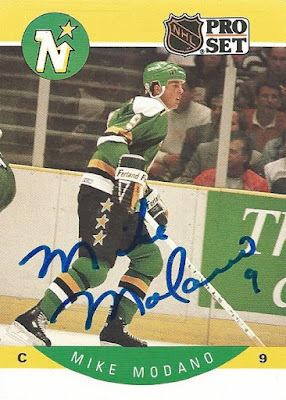 How about an autographed rookie card of the man who has the most career goals and most career points of any American-born player in NHL history? 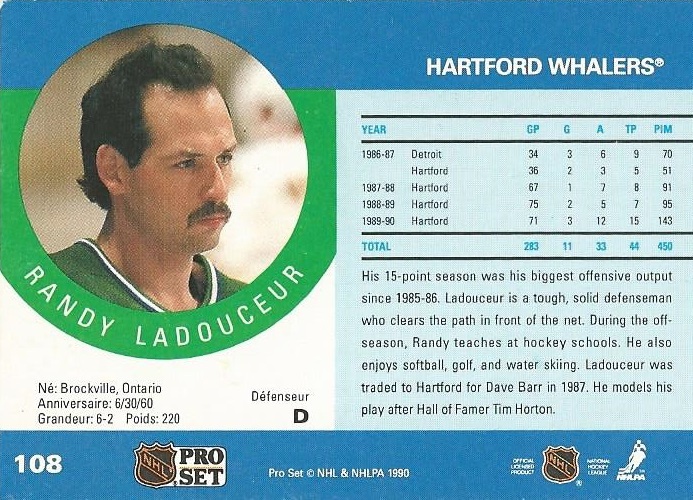 As with the Ladouceur, I have no idea whether this is authentic or not, but given that it set me back $1.25 it was worth a risk. At a quick glance it looks slightly different compared to some of his other autographs that are available out there, however it also looks similar to some I found that were signed in the early '90s as this one may have been. Either way, this card has long been a favorite of mine and I just couldn't resist. It's a great example of how Pro Set using the team colors in the border of the card really tied things together nicely. I also love that it has the classic "tilted photograph" that '70s Topps baseball cards are known for. Plus, look at the stars on those pants! Man, the North Stars had such cool uniforms. No offense to any fans of the modern-day Dallas Stars, but the North Stars were so much cooler if you ask me. Also, Modano rocked a fairly epic mullet back in the day, which you get a good shot of here on the reverse. Well, that's what I have for today. A nice pair of autos from two of the forgotten franchises of my youth. Whether authentic or forged, the two combined set me back less than my morning coffee, and provided some good nostalgia along with a blog post, so I'd call that a win! 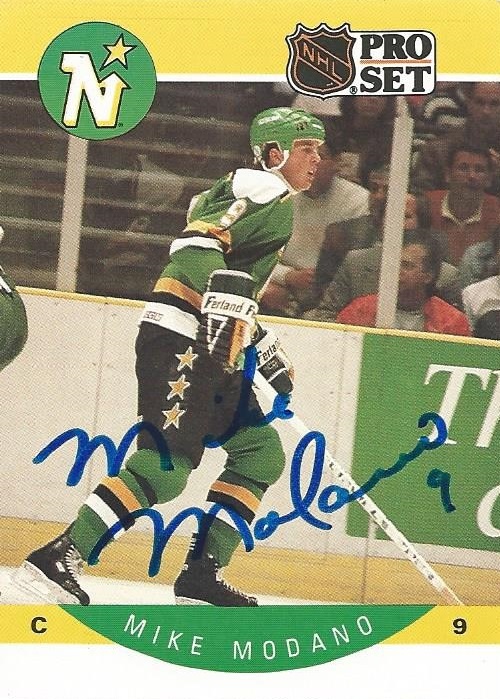 The Modano looks like it was signed by his mom; she has been forging his signature for a while now. You can distinguish it by the way the M’s are portrayed. Those are well worth the price paid. I never heard of Mike's Mom signing his cards. You'd think if she did the least she could do is sign the last name as MOMdano. Dollar Boxin' - Starting Lineup! Celebrating 1,000 Buybacks with Hammerin' Hank!! !